It's all done and legal and everything! The people who sold the house are very nice, they are moving elsewhere in Charlotte to a bigger house. They've been in the house 13 years, were pregnant with the 2nd of their 3 kids when they moved in. There is a rose bush in the back yard--not likely to live long, given my brown thumbs. 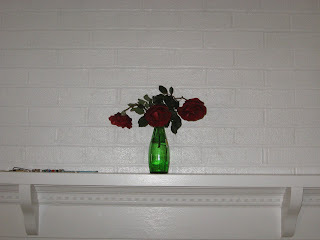 When I walked into the lawyer's office, the first thing the woman said to me was, "We left the last of the roses on the mantle for you." And indeed they did! Possibly the nicest thing a stranger has ever done for me! Saturday is moving day, though I'm sure I'll move in a few things today and tomorrow, and dad was talking about wiping down cabinets and putting in shelf paper, so we may do that tonight.